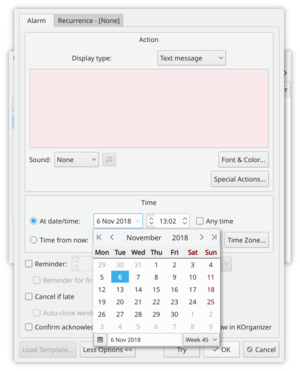 You can schedule alarm messages which pop up on the screen (with sound if desired), or you can schedule audio files to play, commands to be executed or emails to be sent. Specify that a reminder should be displayed in advance of, or after, the main alarm time(s). Specify an audible beep or a sound file to play when the message is displayed, or specify that the message is to be spoken. Choose whether or not the alarm should be cancelled if it can't be triggered at its scheduled time. An alarm can only be triggered while you are logged in and running a graphical environment. If you choose not to cancel the alarm if it can't be triggered at the correct time, it will be triggered when you eventually log in. It is possible to use multiple alarm calendars, which for example enables you to share alarms between a laptop and desktop computer. Alarms may also be scheduled from the command line, or via D-Bus/DCOP calls from other programs. This page was last modified on 20 January 2019, at 16:52. Content is available under Creative Commons License SA 4.0 unless otherwise noted.